SSRIs are among the most commonly prescribed medications for chronic anxiety, but not infrequently these medications may be associated with a short term increase in symptoms that precedes the long term benefit. In an elegant series of studies published online in late August 2016 in the premier scientific journal, Nature, researchers from the NIH and the University of North Carolina at Chapel Hill show the mechanism for this phenomenon, at least in mice. They first identified serotonin circuits activated by fear in the mice. A key circuit connected serotonin cells in the dorsal raphe nucleus (DRN) with the bed nucleus of the striae terminalis (BNST). 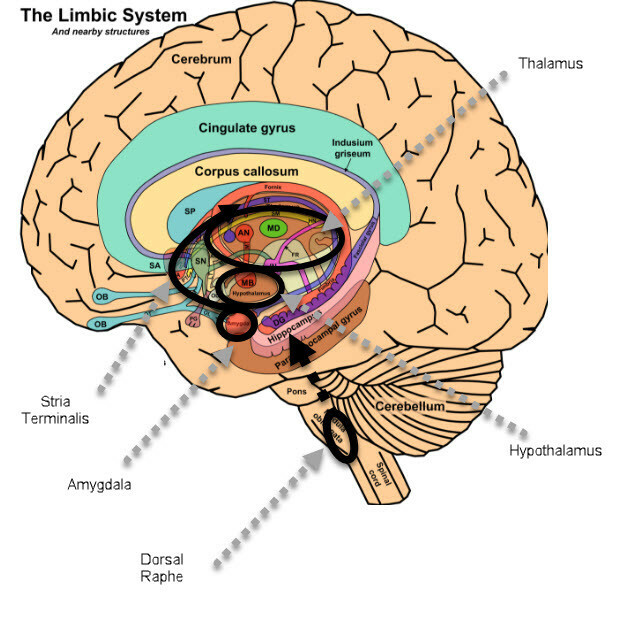 The bed nucleus of the striae terminalis in turn connects the amygdala (a key component of the limbic fear network) with the hypothalamus (a key component of the cortisol stress response system). See a vastly oversimplified diagram to the right. The researchers found that increased serotonin output from the cells in the dorsal raphe stimulated serotonin 2C receptors on cells in the BNST which in turn inhibited an anxiolytic circuit connecting the BNST with the hypothalamus and ventral tegmental area. The result of this reduced activity of the anxiolytic circuit was increased release of cortisol releasing factor (CRF). Inhibition of CRF appeared to counteract this short term adverse effect of SSRI’s… pointing a treatment implication – perhaps CRF inhibitors might be used to make it easier for people who are very sensitive to the this short term adverse effect of SSRI’s to tolerate them. Marcinkiewcz CA, Mazzone CM, D’Agostino G, Halladay LR, Hardaway JA, DiBerto JF, Navarro M, Burnham N, Cristiano C, Dorrier CE, Tipton GJ, Ramakrishnan C, Kozicz T, Deisseroth K, Thiele TE, McElligott ZA, Holmes A, Heisler LK, Kash TL. Serotonin engages an anxiety and fear-promoting circuit in the extended amygdala. Nature. 2016 Aug 24;537(7618):97-101. doi: 10.1038/nature19318. [Epub ahead of print] PubMed PMID: 27556938.